A steering wheel helps us maneuver a car left or right. Imagine the amount of force that would need to be exerted in order to move a bulky vehicle and then imagine if you had to apply all that force with your own hands. Sounds extremely difficult, right? This is the exact reason why power steering technology was created. As vehicles started getting bulkier, bigger tires were introduced, bigger engines were added and the job of steering got even more difficult. The power steering works with the help of a power steering pump. This pump summons a special fluid from a dedicated reservoir and pressurizes to turn the steering gear. This, in turn, enables the wheel to turn without you putting in a lot of effort. 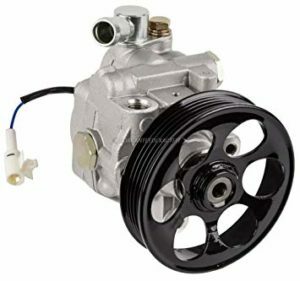 The power steering pump is both mechanical and electrical equipment and so it can lose efficiency over time due to excessive usage. Knowing when it is failing can help you reach the mechanic in time for necessary repairs. The power steering pump works with the help of a fluid, so if the fluid levels run low or the fluid does not reach the pump at all, it would become hard for the steering gear to function properly and that would create unpleasant whining noises when you steer. If you are not careful, and the power steering pump keeps running on critical fluid levels, you could damage the whole system, which could result in some very expensive repairs. The steering wheel will become unresponsive to your gestures when there is an issue with its functionality. You might feel your car is taking a bit longer to turn or that it is not turning at all. This can prove to be dangerous if you are speeding and you need lightning-fast maneuvers. It is advisable that you get your power steering pump inspected by a mechanic at the earliest to avoid any life-threatening hazard. If the power steering pump is nearing failure, it will stop responding completely. Not only will you not be able to steer you will be more prone to accidents. However, this is usually the last stage of power steering pump failure, so it is unlikely you will reach this point unless you overlook the other symptoms. When your car first starts, all the fluids start circulating in their respective routes. The fluid in the steering pump does the same, but if this fluid is insufficient and nearing its end, your car’s power steering pump can shift the timing belt. The belt makes the annoying noise, which usually goes away after a few minutes. When the power steering pump is nearing its end, it will make a loud knocking noise. This noise is the harbinger of further destruction, because if after this noise the power steering pump is not fixed, you are looking at the ruination of several other steering system components such as the steering racks and steering lines. There is not much you need to do in order to test a power steering pump except use your hands and really try to drive somewhere where there are lots of twists and turns. The more you turn and the harder you turn the more symptoms of power steering pump failure will pop. We have already discussed the symptoms of a failing pump, so all you need to do is look out for them while you test drive your car. A nice and empty road preferably at night when there are fewer cars on the road is always a good option. This will help you avoid putting your life or others life in danger if the steering wheel stops responding completely. The major problem with a power steering pump is the loss of fluid. If the fluid inside the pump is insufficient it can develop all sorts of problems so it is advisable to first check for the steering pump fluid. Other than that it is possible that an electrical malfunction occurs which restricts the flow of electricity to the pump allowing it to function properly. This reservoir can be found in the engine bay. It is usually located near the radiator on the front right or on the left. Once you locate the fluid reservoir it is time to check for fluid levels. Open the reservoir’s cap. You will find a dipstick joined to the cap which will help you ascertain the fluid levels. As soon as you take out the dipstick it will already be covered in fluid. Wipe all the fluid with a clean piece of cloth and reinsert in the container. Take out the dipstick back again and inspect the correct fluid level. If you are at critically low levels, it is time to refresh the steering pump fluid. You can find the fluid very easily in any car store. 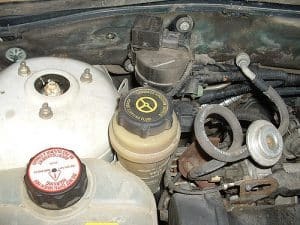 Once you are done with fluid replacement, reinsert the reservoir cap and dipstick and tighten the cap firmly so that no liquid leaks out when the car is in motion. A lot of cars do have an electric power steering pump. In case, The power steering pump in your car runs on electricity, so if there is an improper flow of electricity to the pump its functions will deteriorate. In order to test the proper flow of electricity, you need to use a high impedance voltmeter. If there is an irregular flow of current to the pump, it is possible the battery is causing the malfunction. You should replace the battery first and then go for a pump repair. When the power steering pump is beyond repair you have no other choice but to get it replaced. Power steering pumps are either too expensive or too cheap depending on the make and model of your car. Normally, you would be charged $200 – $350 for the replacement which includes the cost of labor.